When the neighborhood institution St. Mark’s Bookshop was struggling to pay its sky-high rent back in 2011, it asked landlord Cooper Union for a break to prevent having to relocate from its iconic 3rd Avenue and East 9th Street location. The institution wouldn’t budge, so the East Village and book-loving communities banded together in an attempt to save the store. Though after petitions, cash mobs, and celebrity visits, the owners announced in March that they’d be moving their shop to 136 East 3rd Street at Avenue A. Longtime patrons were nervous about the new outpost, which recently opened its doors in the historic First Houses complex, but the contemporary design by Clouds Architecture Office does not disappoint. 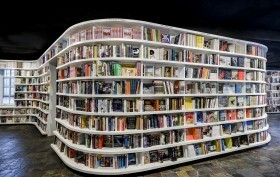 The undulating bookshelves snake through the shop, encouraging customers to peruse the eclectic collection of literature and freeing up interior space for neighborhood events. Through the storefront windows, the colorful books pop against the stark-white shelves, a true feast for the eyes.